Christian Hahn is Doctoral Candidate in the Clinical Psychology program at the University of Western Ontario. He received his undergraduate degree from Saint Mary's University in Halifax. 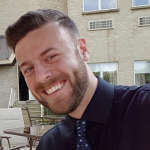 Christian's research focuses on the ways in which the cognitive and behavioural symptoms of social anxiety impact maintenance processes in romantic relationships. Additionally, Christian pursues his clinical interests in adult tertiary care with emphasis on mood, schizophrenia, and bipolar disorders. Request More Articles From Christian Hahn, M.Sc.